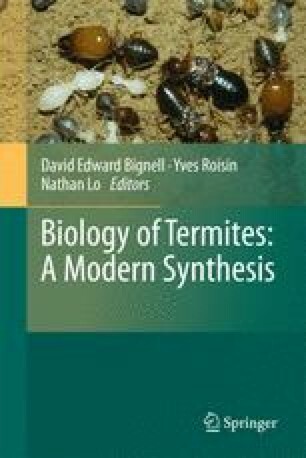 While pest species of termites are thought to belong predominantly to four families comprising the lower termites, the species causing the most damage to tropical agriculture belong to three of the four subfamilies of higher termites, lacking protist symbionts. A wide range of crops are affected, including trees in plantations and orchards, coconuts, palms, sugar cane, rice, maize, wheat, sorghum, groundnuts, coffee, tea, cocoa, yam, cassava and cotton. Market gardens and pastures can also be damaged. Organochlorine and organophosphate insecticides, once very effective agents of chemical control, are now prohibited or restricted, owing to their several toxicities, but alternatives of comparable efficacy in cropping systems are yet to be found. Integrated control strategies, combining improved cultural practices, attempts to increase plant vigour, and the introduction of biological agents to reduce termite populations may hold some hope for the future. Among the biological agents, entomopathogenic fungi and nematodes seem the most suitable for research and development.